This week 96 3 NOW and your lovely Prize Goddess have a great hook up for you. The good folks at Universal Pictures sent us a stack of DVD’s that will help keep the little ones happy until Spring is really here. 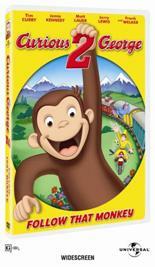 You can win copies of CURIOUS GEORGE 2 and LEGO: THE ADVENTURES OF CLUTCH POWERS both new to DVD and available in stores right now. Just sign up HERE. We’ll be picking winners from NOW through March 11, 2010.